Mesothelioma has a characteristically long latency period – it can take decades for symptoms to emerge, negatively impacting prognosis. The latency period for mesothelioma starts when a person is exposed to asbestos. On average, it takes 30 – 45 years before mesothelioma symptoms develop. A number of factors can impact the latency period experienced by an individual. Delayed onset of symptoms is the biggest reason mesothelioma has a poor prognosis. There are a variety of reasons that make mesothelioma and other asbestos-related diseases harder to recognize than other cancers. Malignant mesothelioma is aggressive and terminal, known to be caused by exposure to asbestos. Diagnosis is challenging for physicians as mesothelioma symptoms often mimic those of other conditions, but also due to its long latency period. Latency period for mesothelioma represents the amount of time between asbestos exposure and the emergence of symptoms. A challenging component of diagnosing mesothelioma is that symptoms can take decades to emerge. Since many people also don’t even realized they were exposed to asbestos in the first place, early diagnosis can be hindered even further, ultimately impacting treatment options and life expectancy. The average latency period for mesothelioma cases is 30 – 45 years, which is why those 55 years and older are most commonly diagnosed. Despite the median latency period being upwards of three to four decades, there continue to be cases of mesothelioma in children and teens because of early exposure or other mesothelioma risk factors, like genetics. Some victims have experienced symptoms as early as 10 years after exposure to asbestos, though some have taken up to 50 years. Duration of asbestos exposure: The longer someone is exposed to asbestos, the more fibers that are inhaled into the body, which increases the risk of developing mesothelioma. The longer someone is exposed, the shorter their latency period is likely to be. Frequency of concentration and exposure: Exposure level impacts latency period, taking the concentration of exposure and frequency into account. For instance, continuous inhaling or ingesting of large amounts of asbestos will lead to shorter latency periods, which is often the case for high-risk occupations with high levels of exposure. Type of asbestos: The term asbestos encompasses several different types of naturally occurring cancer-causing minerals, including chrysotile, amosite, crocidolite, tremolite, anthophyllite, and actinolite. The most deadly is crocidolite asbestos, which may cause shorter latency periods. Age: According to researchers, the older an individual is when exposed to asbestos, the shorter the latency period is likely to be, potentially due to a weakened immune system and difficulties fighting the damage caused by asbestos fibers. Gender: Studies have suggested that men have longer latency periods than women. Researchers suppose that this is because men have traditionally filled positions that are high risk for occupational exposure, while women were more often subject to secondhand exposure. After inhalation or ingestion and the lodging of asbestos fibers within the lungs, abdomen or heart linings, it takes years for scarring and inflammation to cause cell mutation, contributing to the long latency period. The decades-long period before symptoms emerge presents many challenges in terms of mesothelioma diagnosis, prognosis and treatment for patients. With mesothelioma symptoms taking so long to appear, it’s often difficult for physicians to pinpoint the disease, which in turn leads to frequent misdiagnoses of more common diseases, such as lung cancer or even the flu. A delayed accurate diagnosis can limit treatment options as the cancer spreads and aggressive treatments are no longer a viable option. Depending on the stage at diagnosis, patients may be subject to solely palliative treatments if their cancer isn’t caught until it has already metastasized. The prognosis for mesothelioma is known to be poor, which is largely due to the long latency period. The longer it takes for mesothelioma to be diagnosed and treated, patients will face a shorter the life expectancy and have more limited the treatment options. 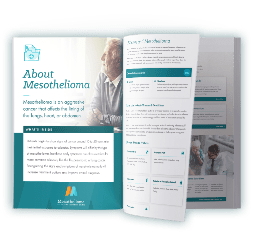 The latency period for mesothelioma further emphasizes the importance of recognizing any potential symptoms to ensure that patients get the care they need right away. With early detection, mesothelioma patients can give themselves the best options for aggressively treating the cancer. 1 Lanphear BP and Buncher CR. Latent period for malignant mesothelioma of occupational origin. Journal of Occupational and Environmental Medicine. July 1992;34(7):718-721. 2 Reid A, de Klerk NH, Magnani C, et al. Mesothelioma risk after 40 years since first exposure to asbestos: a pooled analysis. Thorax. September 2014;69(9):843-850. doi:10.1136/thoraxjnl-2013-204161. Page last modified on August 20, 2018.